See, I even bookmark my favourite pages! This is my Bible. 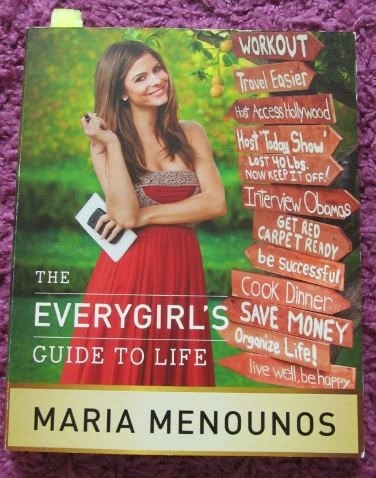 And the author, Maria Menounos is one of my idols. It covers everything a girl/woman would need from organising your living space to beauty and fashion, love to health and fitness. Nobody has sent me this book, I bought it using my own money so no-one’s making me say this! It’s easily the best reference book I’ve ever read. I refer to it frequently, whether I need suggestions as to how to sort out my wardrobe to which friends I need in my life. 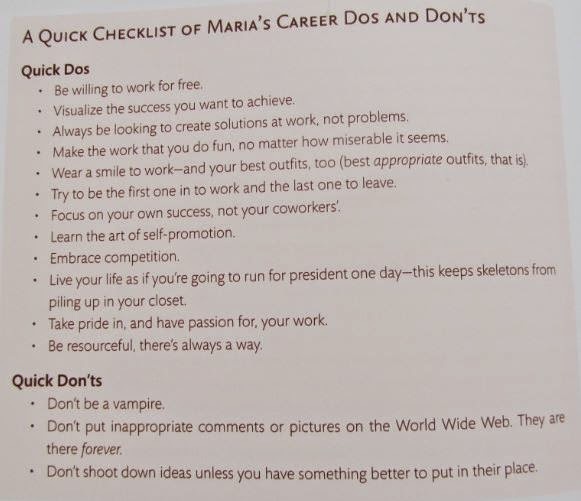 The best thing about this book is that Maria never tries to tell you to do something; she shares her own experiences and hopes to guide you into making the right choices but never forces you to buy something or do something. For example, she encourages you to eat healthily and exercise regularly but doesn’t give you a strict regimen to follow. Instead she suggests to ABM- Always Be Moving. That way at least you’re getting some movement into your day. It’s so easy to read and to select your favourite sections. My favorite sections are right at the beginning. There’s a whole section on organising your living space and maximising the space that you have. 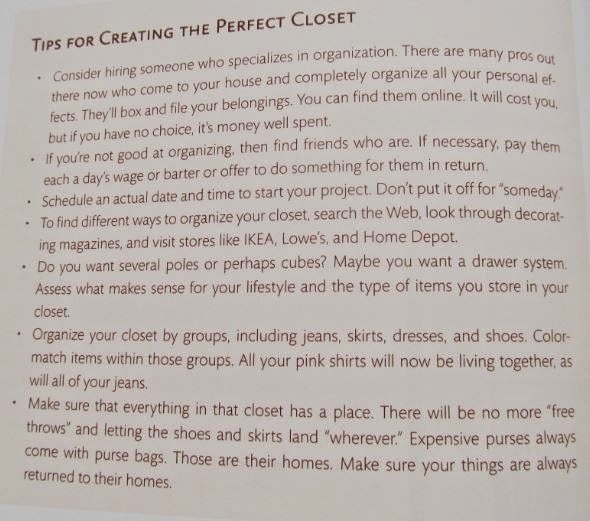 Now I’m a neat freak so I could not be more happy that someone has gone into great detail about how to go about this! She also has a whole chapter on decor and interior design which I found hugely interesting but it’s no use to me right now. I’ll be sure to keep it to hand when I have my own place! One of the ingenious ideas she has is using your car as a mobile office. As I am saving up for one at the moment and hopefully will have one any day now, I’ll be using this guide. She provides a list of things that are useful to keep in your car such as toiletries, medical kit, gym clothes and a good old-fashioned map! For someone who obviously more money than the majority of, she is obsessed with saving. 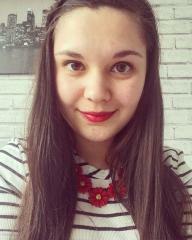 She focuses on buying staple clothing items that you will wear forever, basic skincare and make-up items that most of us use on a daily basis and making a routine for your days off when you have all those errands to do. The last point is something she is big on. She constantly makes to-do lists so she doesn’t forget anything. I’m all for it; I’m forever forgetting things I need to do so I make a list every night of things I need to do the next day or in the upcoming week. That way I can tick them off when I’m done and feel a sense of accomplishment when every task is ticked! 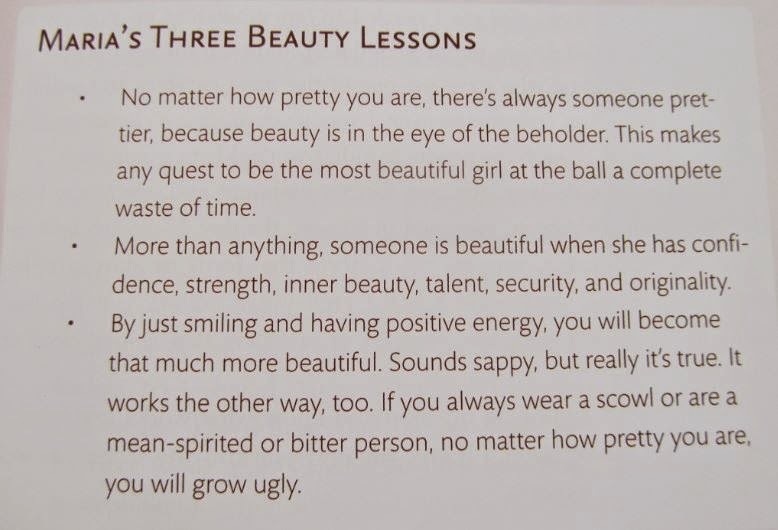 There are chapters on fashion and beauty but like I said, she hones in on the items that we all need, not what we want. I am the first person to admit that I have too much stuff but with the help of this stuff, I am starting to buy only the essentials not everything in the whole shop! She also has sections within the fashion chapter of what to wear for certain events and occasions. I’m often going places and having no idea what to dress like. 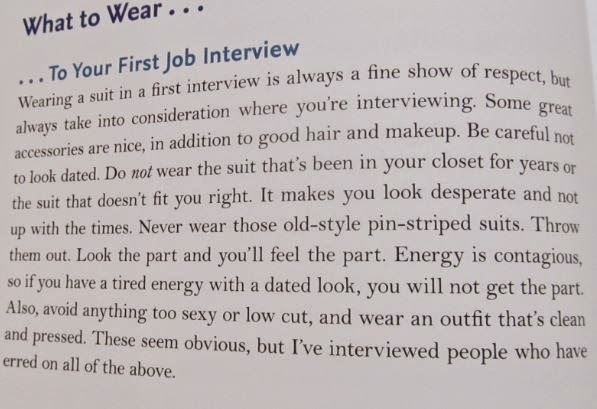 She points out the key places we have events such as dates or interviews and suggests the most appropriate outfits. Again, it’s merely a suggestion, she never tells you what you have to wear. There are chapters on health, diet and fitness but if you’re after more diet and fitness tips, I’d suggest buying her Guide to Diet and Fitness which I also own! That goes into more detail and I will review it at a later date! Look at this woman’s closet! I guess a girl can dream! This is the most helpful guide for closet maximising. 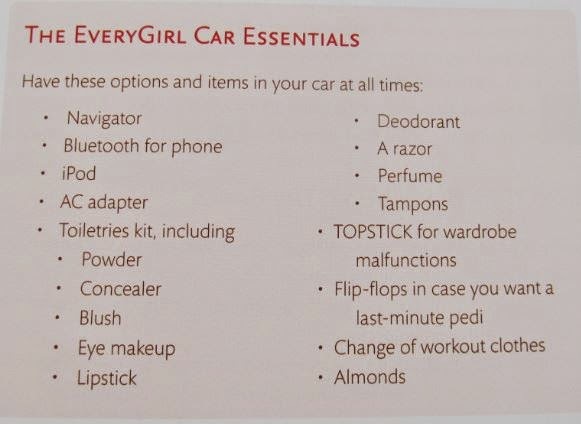 All a girl will ever need whilst on-the-go. Not dressing appropriately for the situation is one of my biggest pet peeves. 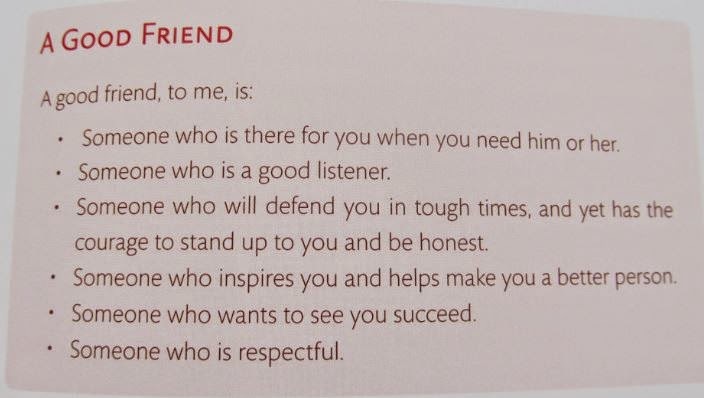 Find friends who bring out the best in you. Make the most of work. Are there any books that you live by? Do you love these sort of guides?